Up to 25 year Guarantee. DuraTherm Flat Panel Heated Towel Rail. Coated in several layers of chrome. 1894 BTU's heat output. The alluring Flat Panel Heated Towel Rail from DuraTherm will help to create a minimalistic and sleek look in your bathroom. The flat panel bars will give a designer look - perfect for more modern styled bathrooms. The classy DuraTherm Flat Panel Heated Towel rail creates an eye-catching focal point in the bathroom. It looks excellent and has the practicality of plenty of hanging space to dry or warm up your towels. Featuring a whole host of benefits, this towel rail combines unique styling and efficient functions this towel rail is the perfect addition to any family home where towels are constantly in use. Not only do heated towel rails dry your towels but they can double up as a radiator to keep your bathroom warm on those chilly winter mornings. You can clearly see why theyre one of the most popular products on the market! We believe there is nothing better than getting out of the most relaxing bath and being wrapped up in the warmest and fluffiest towel, and there is no better way than achieving this than a heated towel rail. Features and benefits: 1600 x 600mm Stylish and modern designer heated towel rail The most effective way of drying your damp towels Wall mounted design All fittings and fixtures are included for an easy installation High quality steel construction Coated in several layers of chrome No of Rails - 12 Heat Output (BTU) - 1894 Towel rail valves not included - Available Here. 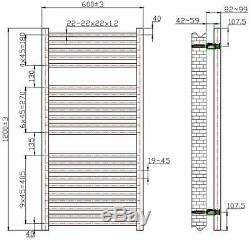 10 Year Guarantee Dimensions: Height:1200mm Width:600mm Tube Centres: 550mm. View Our Range Of Towel Rail Valves Here. View Our Range Of Bathroom Accessories Here. 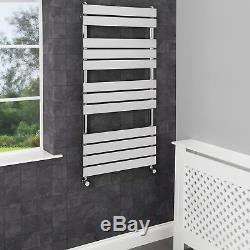 Heated Towel Rail Radiator Bathroom Central Heating Flat Panel Chrome 1200x500mm. Heated Towel Rail Radiator Bathroom Central Heating Flat Panel Chrome 650x400mm. 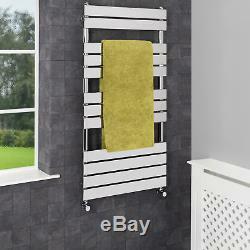 Heated Towel Rail Radiator Bathroom Central Heating Flat Panel Chrome 950x500mm. Due to this we ask that you do not arrange to have an installer on site until after your order has arrived and you have checked the goods. We cannot pay installation costs in the event that the product is damaged in transit or is not suitable for any reason, so it is important to double check everything is in order before you begin the installation process In the unfortunate event that a product cannot be delivered within the quoted timescale we will contact you to make you aware and give you the opportunity to change your order. If your address is a communal building such as a block of flats, please be aware that in order to prevent fraud identification will be required to receive the goods. I do not wish to keep my item - it is not faulty. We will require photographs showing the presumed faulty item and the issue you are experiencing. Checking goods for damage and notifying us. If someone else is signing for the goods on your behalf you agree to advise them that the goods must be checked and you accept full responsibility for any loss or damage if they sign on your behalf and fail to check. Online Home Retail Ltd Units 2, 3 and 4 Millennium Court Enterprise Way Evesham Worcestershire WR11 1GS. Q - My item arrived damaged, what should I do and how long have I got to report it? A - You can call our customer services team or send a message to us reporting your damaged item. Q - Can I combine more than one item under the same carriage charge? This will mean you only pay one carriage charge. If you pay for each item individually then you will pay carriage for each item. BUT PLEASE DO NOT LEAVE ANY ITEMS UNPAID FOR MORE THAN 14 DAYS, OTHERWISE THIS MAY RESULT IN UNPAID ITEM DISPUTES BEING OPENED AGAINST YOU. Q - Can I collect? Wait for your collection notification. Head to your chosen store with your collection code and collect your parcel its that simple. Your parcel will be held in-store for up to 7 days from when we notify you. Q - Can I make you an offer for an item? A - We do not accept offers for single items as we strive to offer the UK's most competitive prices in the first place. Q - Can I pay by cheque or bank transfer? Bathroom Shower Mixer Thermostatic Set Twin Head Chrome Exposed Valve Square Set. Product well packaged and a great price. Bathroom Shower Mixer Thermostatic Set Twin Head Chrome Exposed Valve Round Set. Mira Jump Electric Shower 10.8kW Power White & Chrome 1.1788.012. Modern Monobloc Kitchen Mixer Tap with Pull Out Hose Spray Single Lever Chrome. Flo-Force Extra Domestic Sanitary Macerator Waste Pump 600w 3 Inlets. Thermostatic Shower Mixer Square Chrome Bathroom Exposed Twin Head Valve Set. Mira Sport Electric Shower 9kW Power Boost Flow White & Chrome 1.1563.003. Close Coupled Toilet Modern Bathroom White Square Ceramic Soft Close Seat WC Pan. Bathroom Taps Chrome Basin Mixer Bath Filler Shower Deck Waterfall Tap Sets. Many people forget what the bathroom really is a place of relaxation and an environment where you can let your worries wash away. The bathroom is essentially the foundation of your day. Not only do you spend your mornings in there getting ready and preparing for the day ahead, but you also come home to it, ready to unwind and bathe in bliss. As one of the UKs biggest and most renowned online bathroom retailers, were well aware of how important your bathrooms image and functionality is. This unique factor enables us to provide you with elegant bathroom solutions at discounted prices that no high street store can match. Our range is focused on you and your bathroom, with styles that will suit both traditional and contemporary designs. So whether you want to spruce up an old, tired looking bathroom or even if you want a full suite for a complete refurbishment, our comprehensive range of luxury furniture and accessories will ensure you can find what you want. Whether you want your bathroom to be designed for a splash and dash in the morning or whether you want to have the luxury of a tranquil home spa experience waiting for you when you get home. Were confident that Plumbworld can help you create the bathroom of your dreams. For news and offers, sign up to our newsletter! The item "Heated Towel Rail Radiator Bathroom Central Heating Flat Panel Chrome 1200x600mm" is in sale since Wednesday, December 13, 2017. This item is in the category "Home, Furniture & DIY\Bath\Towel Rails". The seller is "online-home-retail" and is located in GB. This item can be shipped to United Kingdom.